What to Do with 50 Pounds of Frozen Ahi Tuna? 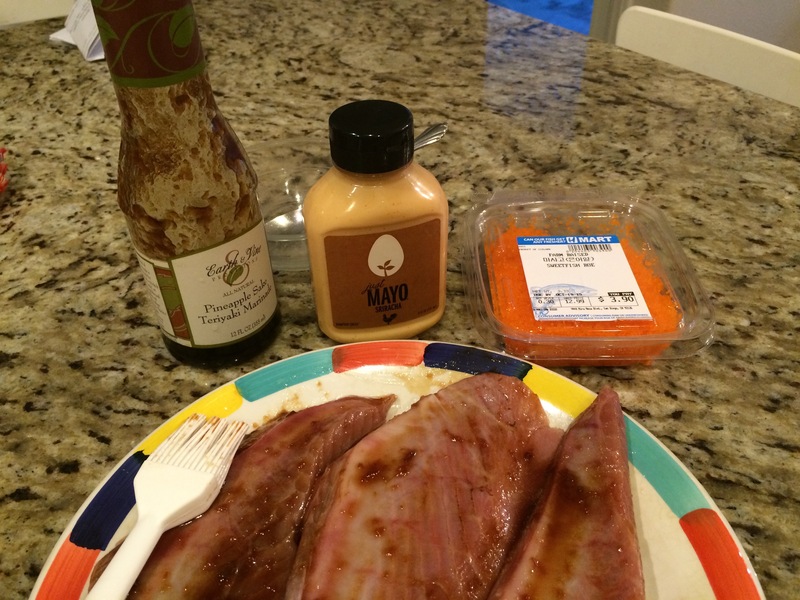 Tuna brushed with teriyaki; Pre-mixed Sriracha mayo, “sweetfish” roe waiting to become sauce, next. -Preheat grill. Brush the fish with oil on the bottom (the side that will be down on the grill) and the teriyaki sauce on the top. -Grill tuna on medium heat until just cooked through, about three to four minutes total (ours was less than one inch thick…), no need to flip over on the grill (there- you have just avoided the big mess that usually accompanies grilling fish… you’re welcome). -Fish can also be seared and served very rare in the middle. “Cooked” ahi is a very subjective term. 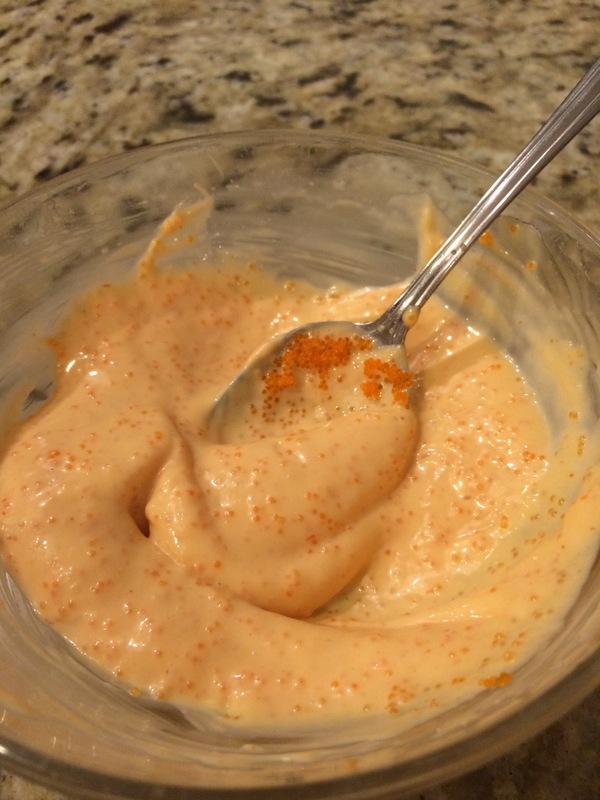 -Mix mayonnaise, sriracha and tobiko/masago/sweetfish roe in a small bowl. 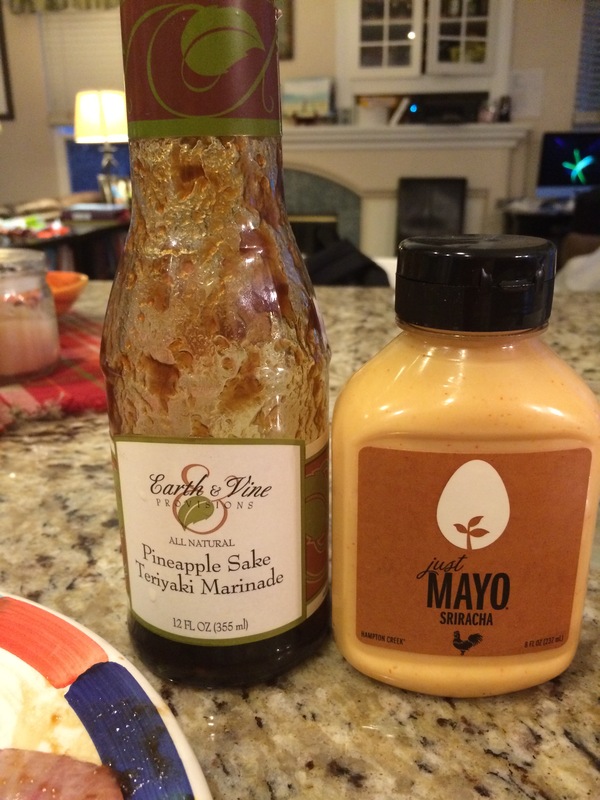 You can also use pre-mixed Sriracha Mayonnaise… I cheated. -Serve a portion of the fish over rice and drizzled with the sauce. We served our rice bowls with shu mai dumplings and edamame on the side. This recipe was inspired by that fabulous food blog DamnDelicious.net, specifically her recipe “Teriyaki Salmon with Sriracha Cream Sauce.” You should visit that site just to ogle her photos and drool over the food ideas. Seriously, go! 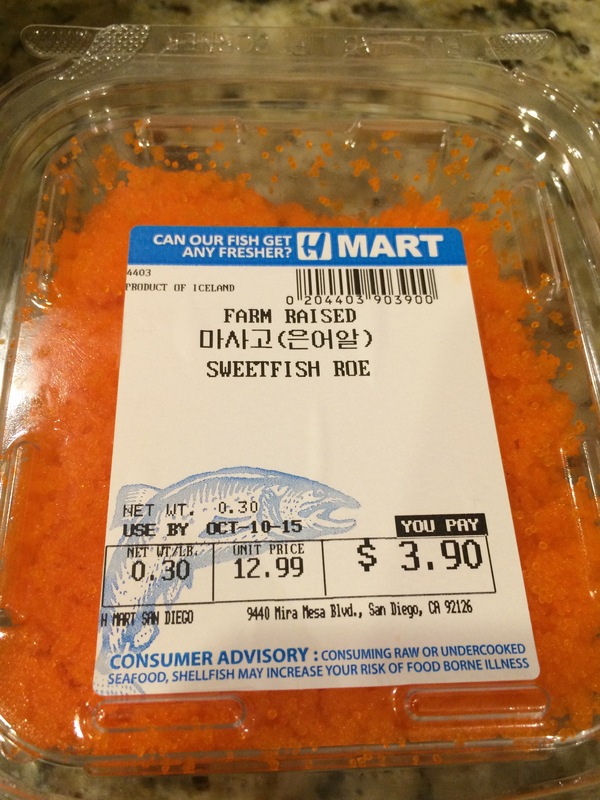 Sweetfish Roe looks the same to me as Flying Fish Roe (tobiko). I think that they are all interchangeable. While we liked this recipe overall, (International Boy approved but The Boy had to be made to choke it down), both The Husband and I think that we really would have liked this better with salmon. But I don’t have 50 pounds of frozen salmon. 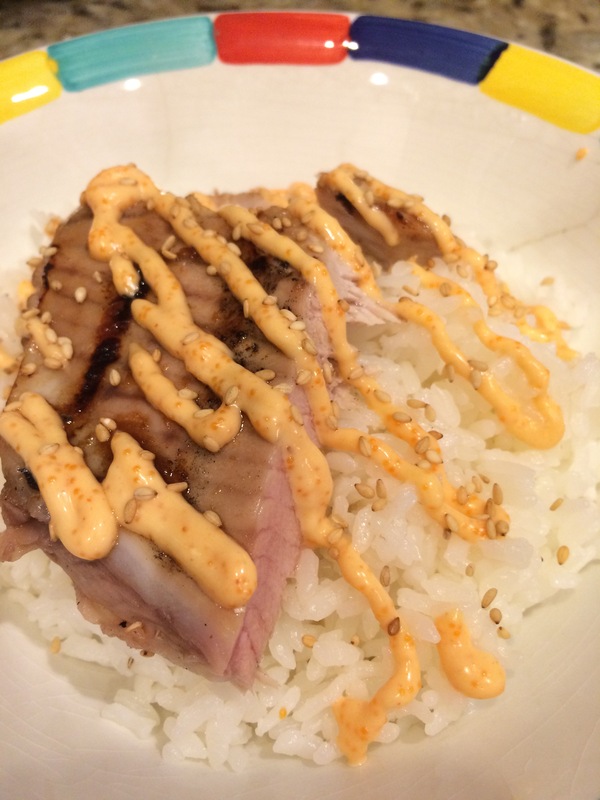 To add a little more detail, we used the Ahi belly, which has skin and more fat than the fillets do, and therefore a different flavor (at least to me). And I did flip the meat to char the non-skin side (for a minute or so). Previous Previous post: New Menu Monday- “Snicker Snacks” Chicken becomes Lemon Chicken- Two Recipes! Next Next post: Bale French Sandwiches… FINALLY- We Hit a Vietnamese French Sandwich Shop!